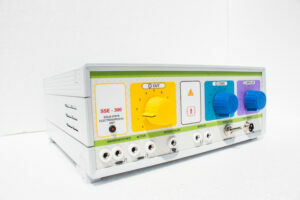 Ensurg 400 is a micro controller based model with all the required features. Full power output at low cost. 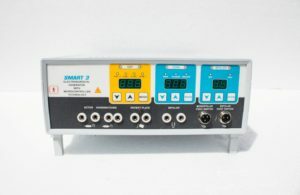 This is the right model for the customers who required basic 400w micro controller based model. 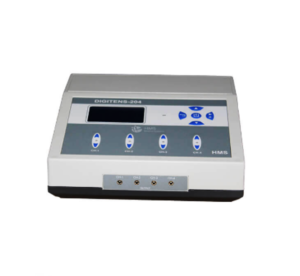 Patient Plate Return Electrode Monitoring System provides instant indication of the quality of contact of the patient plate return electrode. 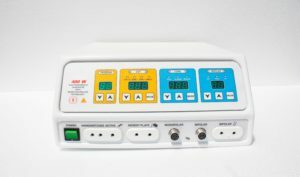 Failure or poor contact results in fault indication with sound alarm which substantially reduces the risk of burn under the patient return electrode. Display : 7 Segment LED Digital. Monopolar Cut Modes : Pure Cut, Blend1, Blend2, Endo Cut. Bipolar Modes : Micro, Macro, Cut. Dimension (WxHxD) & Weight : 300 mm x 150 mm x 340 mm & 5.5 kg. Power socket will be be provided free of cost as per country requirement. 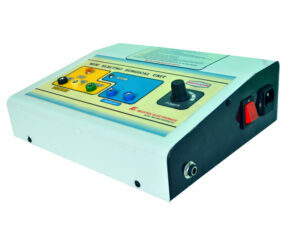 Technical Specification Power Digital : 300 W. Monopolar Modes : Cut, Coagulation. 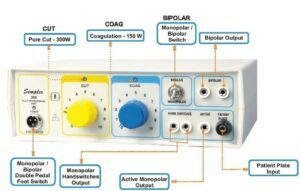 Bipolar Modes : Cut, Coag. 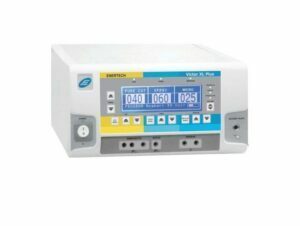 Tissue Response Circuit : NA Patient Plate Monitoring System : NA Input Voltage : 170 to 260 VAC 50 Hz Dimension (WxHxD) & Weight : 3.5" x 13"x 12" & 3 kg. 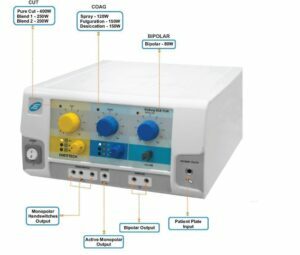 Ensurg SSE - TUR Plus is a 400W analog model with number of cut, blend and coagulation modes with to do under water surgery. This is the model with all around capabilities and simple of operation. It is the lowest cost model in similar class available today in the market. Monopolar Cut Modes : Pure Cut, Blend1, Blend2. Victor XL is a high performance micro controller based model With 20 programs with host of features and modes for all around superior capabilities. This is the right model for the customers who require all the features and controls at a reasonable price. 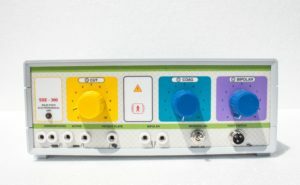 Victor XL Plus is a top of the line micro controller based model with 99 programs, high speed tissue response circuit and host of modes and superior bipolar performance for the customers who demand the best. 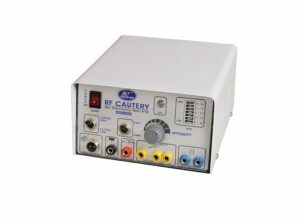 Quick Reference Power Digital : 400 W Programs : 99 Capability : All surgeries Top of the line model. 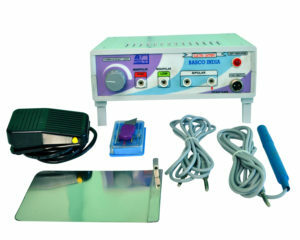 Technical Specification Max Power : 400W Display: Graphical LCD Display Programs: 99 Monopolar Cut Modes : Pure Cut, Blend1, Blend2, Endo Cut Monopolar Coagulation Modes: Spray, Dessicate, Fulgurate. Bipolar Modes: Micro, Macro, Cut. 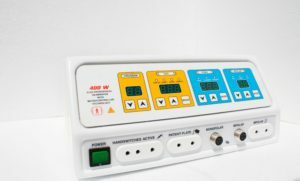 Tissue Response Circuit: Present Patient Plate Monitoring System: Present Dimension (WxHxD) : 300 mm x 150 mm x 340 mm Supplied Accessories For accessories detail please check the photograph Power socket will be be provided free of cost as per country requirement. Dimension (WxHxD) & Weight : 4.5" x 10" x 11" & 3.8Kg. Sr no Particular No’s of pcs. 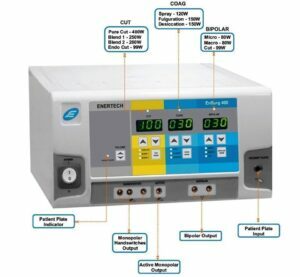 Ensurg 300 is micro controller based model with 6 programs, best price performance ratio in similar class of generators offered by other manufactures and can be widely used in procedures including urology, GI, Gynecologic, Orthropedic, Thoracic and Plastic Surgery. 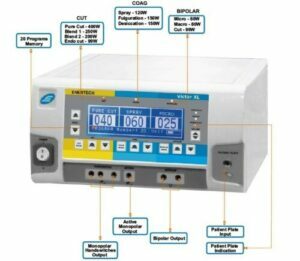 Power Digital : 300W Programs: 06 Capability: All surgeries but till 300 W powerIdeal where 400 W not required. 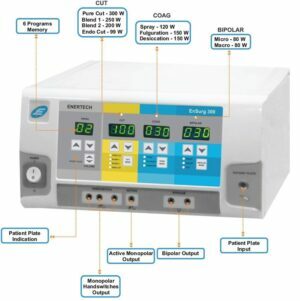 Performance Features: Real Time Tissue Response Technology: Real Time Tissue Response Technologies provides surgeons with superior performance at lower power setting, minimizing the risk of tissue damage and neuromuscular stimulation. 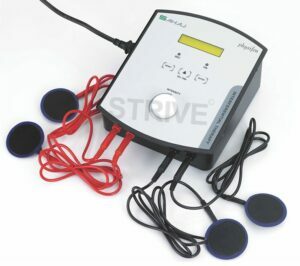 Patient Plat Return Electrode Monitoring System: Patient Plate Return Electrode Monitoring System provide instant indication of the quality of contact of the patient plate return electrodes, Failure of poor contact result in fault indication with sound alarm which substantially reduces the risk of burn under the patient return electrode. High Power Efficiency of 97%: The power efficiency of Enertech generators are the highest in it’s class 97%. 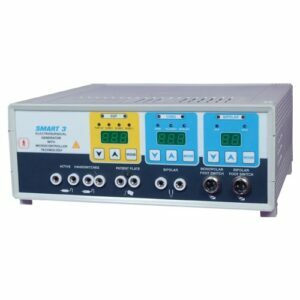 This leads to multiple benefits like increased reliability, most compact size, high portability, economy and reduced power consumption. Technical Specification: Max Power: 300w Display: 7 Segment LED Digital. Programs: 6 Monopolar Cut Modes: Pure Cut, Blend1, Blend2, Endo Cut. Monopolar Coagulation Modes: Spray, Dessicate, Fulgurate. Bipolar Modes: Micro, Macro. 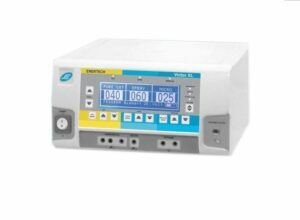 Tissue Response Circuit: Present Patient Plate Monitoring System : Present Dimension (WxHxD) & Weight: 300 mm x 150 mm x 340 mm & 5.5 kg. Supplied with all standard accessories For accessories detail please see photograph Power socket will be be provided free of cost as per country requirement. Offers good choice of monopolar and Bipolar current. Portable model attached with briefcase for safe handling. 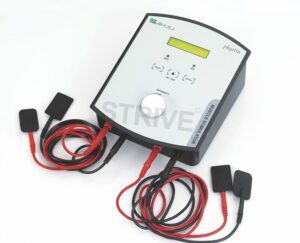 Intensity variable accurately ( 50 to 100 watts output). Ideal for minor and instant coagulation, dessiction and fulgeration. Useful for E.N.T Surgeons, Dermatologists, General Surgeons and Cosmetologists. Surgical handle : 01 No. 5 Electrodes, : 05 Nos. Foot Switch : 01 No. Inactive Plate : 01 No. 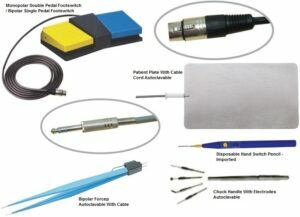 Tweezers with cable : 01 No. Main Cable : 01 No. Operating Manual : 01 No. Power socket will be provided free of cost as per country requirement. 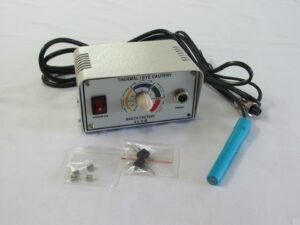 Intensity variable accurately (50 to 100 watts output). 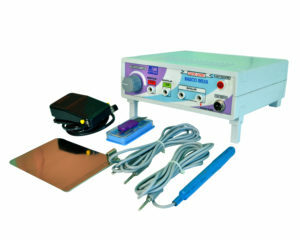 The Technique of Radio Surgery involves the passage of high frequency radio waves ( 2 Mhz – megahertz) through soft tissue to cut, coagulate, or remove the tissue. Soft tissue resistance to there radio waves caused the cellular water in the soft tissue to heat, which produces steam, an results in cellular molecular dissolution of individual tissue cells. 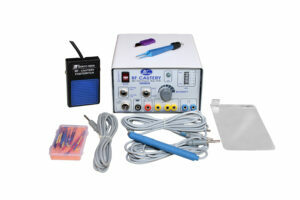 Mini Electro Surgical Unit with Spark Gap Generator. Most suitable for skin Surgeons for Desiccation. 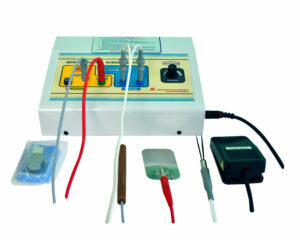 Fulguration, Coagulation and Epilation Bipolar and Unipolar current modes are available. Surgical handle, : 01 No. 5 Electrodes, : 05 Nos. Electrolysis Needle, : 01 No. Foot Switch : 01 No. Inactive Plate : 01 No. Tweezer with cable : 01 No. Main Cable : 01 No. Operating Manual : 01 No.